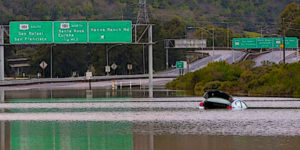 The photo above is breathtaking reminder of the toll our rainy season has taken on San Francisco Bay Area residents. El Niño surprised us with a ferocious encore performance. Many of our properties, roads and highways are still recovering. Highway 37 is an extreme example of what happens when drainage fails. Five feet of water flooded a 3-mile stretch of the highway after the heavy storms this winter. Ditches on either side of the highway act effectively as drains, keeping water from flooding the road in a typical rainy season. But, this year, back to back storms prevented them from draining. Having no place to drain the overflow, efforts by Caltrans to pump the water out were stymied. An emergency solution included raising a portion of the roadway and fixing the drainage system by installing larger pipes, giving it greater capacity for moisture. It seems to have worked. No unexpected weather has tested it yet, though. 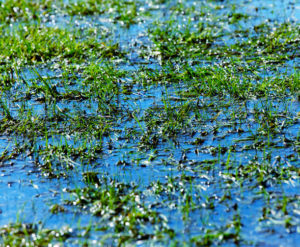 Does your property have any areas of standing water, mulch that is washing away, soggy grass or mosquito problems? If so you probably have poor drainage that winter storms have exposed. 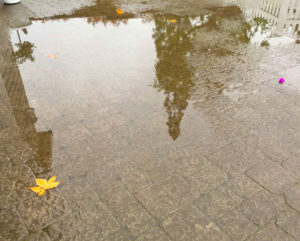 If your hardscape has had standing water for sometime it could be due to these issues. Improper grading. The photo on the right is an example of pooling water showing improper grading. Blocked Drains Debris, mulch or plant material could have gotten in from winds and rain. If the drainage problem is not resolved your structure’s foundation can be at risk. Re-grading. Over time a property will settle. Clear out drain grates and pipes. They should be maintained consistently. Laying down gravel around the perimeter of the drain grate can help in its maintenance. Retaining wall. This can also resolve a slope problem. It can be also be improper grading. But more likely it is compacted soil. Previous drought conditions and/or degraded soil will shrink its pore space that normally allows water and nutrients. You can tell if soil is compacted because its surface is hardened. Soil texture needs to be loose enough to allow water to pass through. Clay soil, common in the San Francisco Bay Area, is the opposite. Water will pool on top and you will have soggy mess of plant material. This is true of all plants. They will decline and rot. You can observe this problem by its smell – foul odors. By sight – grey, red or orange spots and insects. Aeration. This is perforating the soil opening up its pores to allow nutrients and moisture. Creek beds are another good solution. 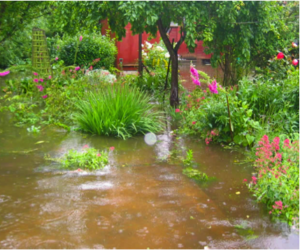 A planted area should be designed to allow the water to flow out and be distributed to other areas. Consider natural water flow. A proper slope needs to be calculated with a site level during the design process. Plant root damage will occur if soil is saturated for a prolonged period. Soil is saturated when its ability to absorb is tapped out. If it is a slope problem, regrading will help. Correcting a slope problem involves directing surface water to the lowest spot on the property which will empty into a drainage ditch, catch basin or well. Creek beds, french drains and bioswales are great options! A common problem. If gutter down spouts are not properly installed they can empty rainwater into the landscape it will damage plant material and your hardscape. Your structure’s foundationPlant root damage, erosion and hardscape will be degraded. Hire a professional to re-direct the spouts so the water goes downhill. At the very least call one and discuss your drainage problems with them. Your plant material, trees, hardscape including driveways and your building’s foundation are too important. Gardeners’ Guild has a construction division with many years of experience resolving all kinds of drainage problems. Pervious Paving – Pavers that will help with drainage and are sustainable!